My favourite skin care product has got to be Simples' moisturising face wash. 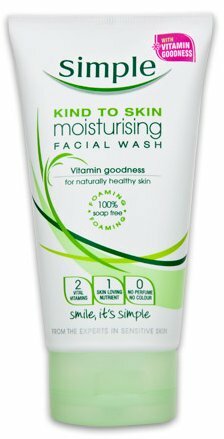 It is the only face wash I have found so far that doesn't dry my skin out and make me all flaky. It doesn't have a smell and is really gentle on sensitive skin. As some of you may know from previous posts I enquired to become a foster carer. A lady from Social Services visited me and told me to wait for a letter with the training dates. I received this letter just before Christmas, the training dates are every Wednesday evening, 6pm - 9pm for 9 weeks. Unfortunately the training is for both me and Mr.A and as he works unpredictable hours in the Army we won't be able to go :-( Not only that but living up North with no friends or family, there isn't anyone to look after the children whilst the training took place. I am gutted, I was really looking forward to taking the next steps to becoming a foster carer. There is still a chance I could become one though... we move back to our home town in Summer 2012 so I am going to apply again. As there has already been a "to buy list" post during the 30 day challenge I have decided today's challenge will be a post on something I really want but will probably never have and that is a VW Beetle in red... Yes I know it isn't beauty related but this is one thing that I would absolutely LOVE. I don't currently drive, I had about 15 lessons last year and was nowhere near being good enough to take my theory test. My anxiety played a big part too, before each lesson I'd feel sick and panicky and my nerves got the better of me each time. Then the wedding drew nearer and money got tighter so I stopped having lessons. 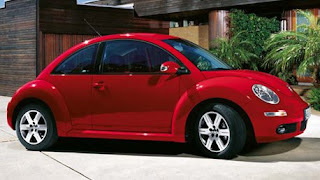 I WILL drive eventually, I need to! -I start by removing any leftover make up with a good old baby wipe, then cleanse my face with Simple's moisturising face wash.
- I moisturise using my Monu revitilising moisturiser that I got in my Glossybox. 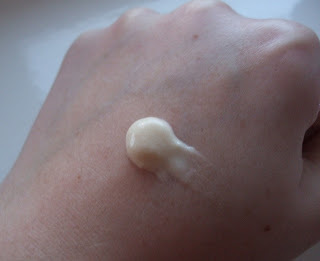 Then I moisturise a second time using my Nivea tinted moisturiser then apply my MUA primer. - If my skin isn't looking too great with the tinted moisturiser alone I use a foundation brush to apply Bourjois Healthy Mix foundation then a dusting of Collection 2000's face powder to take off the shine. - Next to go on is my blusher, its either MAC Dainty or VIVO Sugar Candy. - Onto the eyebrows... 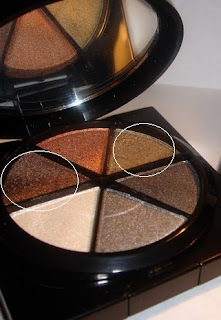 I have naturally dark hair so fill in my brows with the darkest shade from my HD Brows palette. I then apply highlighter to my cheekbones and my brow bone. 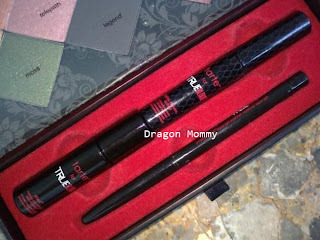 - My usual choice of eye make up is normally black liquid eye liner with a small flick at the end. I find this the quickest and easiest look to create. I then add some mascara to the top and bottom lashes and finish with applying a high lighter to the inner corner of my eyes. This post should really be called "Face from the OTHER day" as I took this photo a couple of days ago. I primarily used the deep plum colour called "Glamour Me" from the True Blood make up pallete (see previous post), with a hint of "True Death" (a really pigmented silver) and "Telepath" (a beautiful shimmery rose petal pink). My brother in law bought me this gorgeous spiky necklace from Miss Selfridge for Christmas, I absolutely LOVE it! 30 Day Challenge- Day 24, Favourite new beauty product. 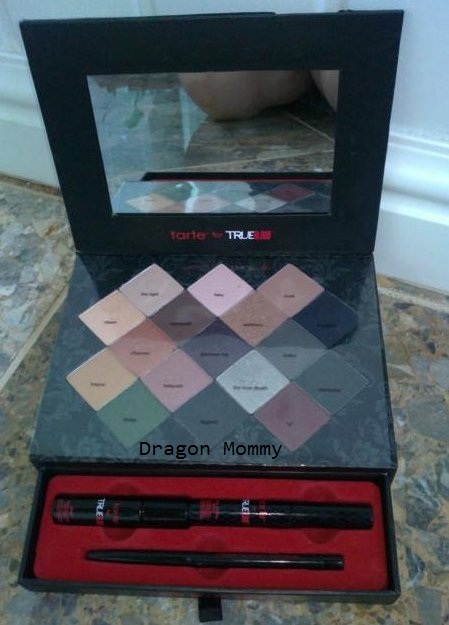 When I saw that the make up brand Tarte had collaborated with True Blood and come up with a limited edition palette I nearly peed myself with excitement. My dad bought it me for Christmas and I was so excited to try it out. The palette comes with 17 beautiful eye shadows all named after the show, a mini eye primer, mini mascara and a black gel eye-liner. It also comes with a card showing different looks and how to create them. I can't decide whether the design on the box is tacky or not? I guess its in keeping with the Gothic/vampire theme of the show. The shadows are all named (such as such as "V", "Fairy", "Telepath", "True Death" and "Stake" ) but to take a good enough photo I had to take the plastic part off. My phone camera takes rubbish photos, you can't see how glittery and shimmery some of these colours really are. Eye primer, mascara and eye-liner pulls out in a cute little drawer. 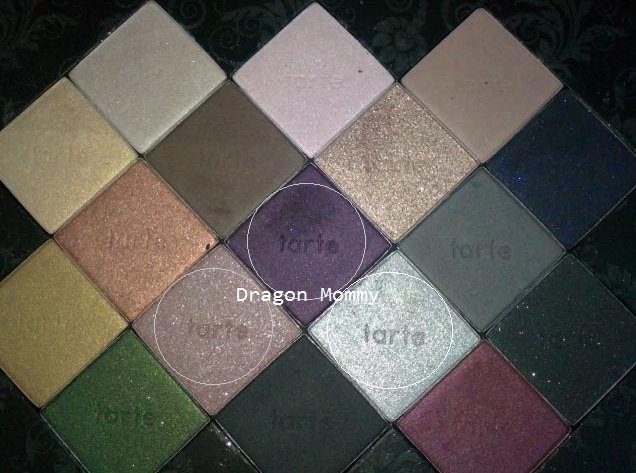 This is definitely my favourite new beauty product, I am so excited to use all the different shadows. 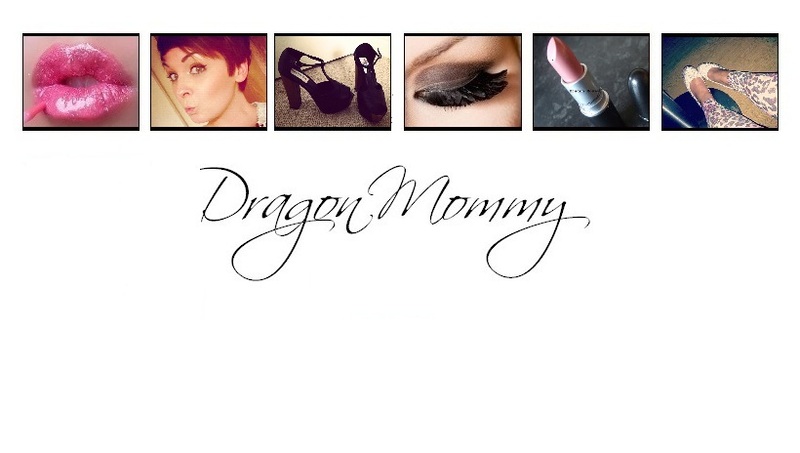 Hello little dragons :-) I hope you all had a lovely Christmas yesterday. We certainly did, I ate so much I felt sick! Unfortunately my two girls caught a sick bug on Christmas Eve and were throwing up every 5 minutes, luckily though they were better by the afternoon on Christmas Day and got to enjoy their dinner and lots of chocolate :-) I had some lovely gifts which I will post about soon. 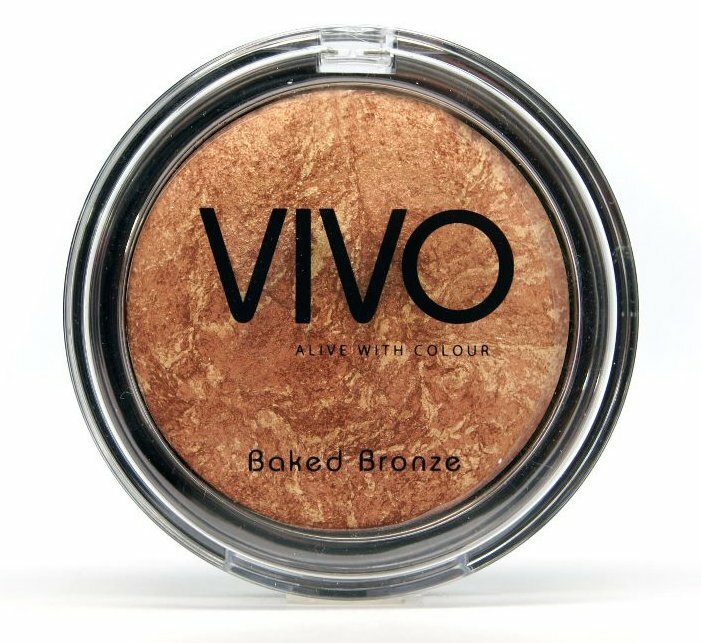 My best bargain beauty item is probably my VIVO baked bronzer. 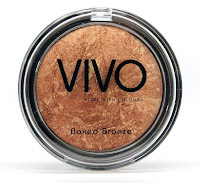 I had always loved my bronzer by GOSH before I decided to try out this one by VIVO. For £5 it is certainly a bargain! 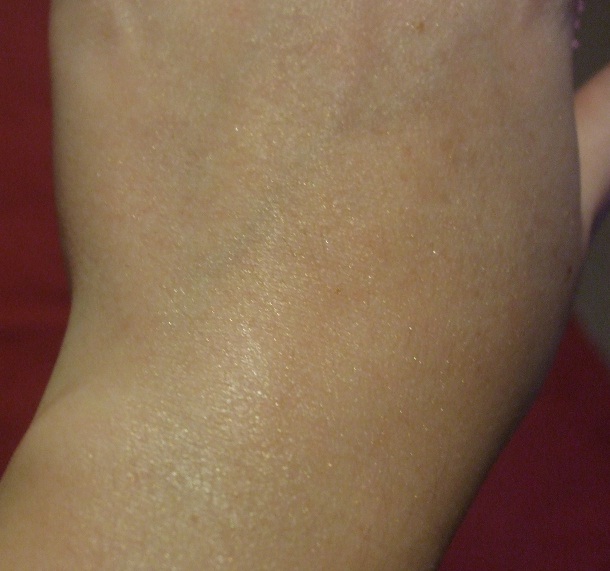 It gives such a lovely golden colour and makes my skin "glow". I've had lots of comments from friends and family on how nice my skin looks whilst wearing this. I will definitely be re-purchasing when I run out. The VIVO cosmetics range is available to buy from Tesco. - Fake tan. I cannot leave the house without fake tan and I certainly wouldn't get my bare legs out without a bit of brown. Some people looks great pale but I do not. I have seen so many girls who I think would look far better with a bit of colour on them. It makes you look healthier, slimmer and can help hide stretch marks and blemishes. - False eyelashes. I LOVE false eyelashes for special occasions. They make your eyes look so much bigger and are so glamorous. 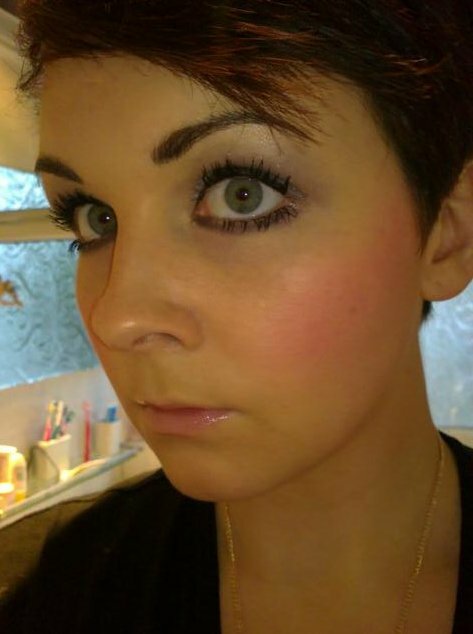 I'm not a big fan of the spider eyes that some girls do by putting on layers and layers of dried up mascara (or the great big HUGE drag queen false lashes!) Falsies are a much more classy way of achieving longer lashes. -Heels. Flats are comfy yes, but who wants to be the dumpy midget in your group of girls at the bar? I'm all for changing into flats at the end of the night whilst trying to hail a cab or walking miles back home in a drunken state but heels are a must for the club. They make your legs longer, slimmer and you walk much more feminine (well, I say that but I have seen quite a few ladies in heels walking like they have a rod up their ar$e) Heels don't have to be sky scraper high (although this is what I prefer to wear myself), there are some really nice smaller heels available. My friend had a pair for Marks and Spencers (yes really!) and they were so pretty, really comfortable too apparently. - Take miniatures. If you tend to get a bit sweaty, take a mini deodorant with you, no-body wants to dance next to a B.O monster. I like to carry a small perfume, mirror and lip gloss too. 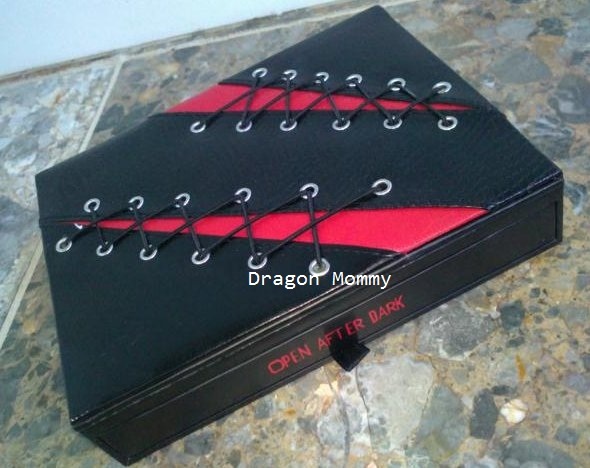 I always take out a little purse just for my I.D and change. I separate my house key from all my other keys just in case I somehow manage to lose my bag and always put this in the zip part of my bag to keep it safe. 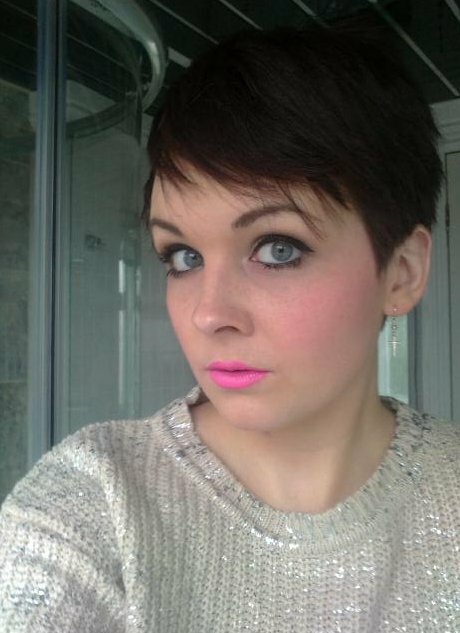 My favourite lipstick is Rimmel Lasting Finish in 006 Pink Blush. 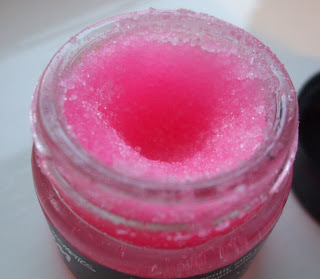 It is a beautiful soft pink and is so moisturising even without applying a lip balm before. It looks lovely with smoky eyes and I love wearing it on a night out. Pink is definitely my favourite shade to wear on the lips, it is so pretty and feminine. I haven't come across another lipstick that has impressed me as much as this one. My most loved mascara has got to be Dior Backstage, My uncle bought me some from America a few years ago and I loved it instantly. It lasts me ages and he has bought me some every year since. I'm due some more now as its starting to dry up but it has lasted me nearly a year! I know we are advised to use new mascaras every so often due to bacteria etc.... but I've never had any problems using mine for so long. It's pricey at £22 but it lasts me that long it makes it worth its money. If I were to use cheaper mascara I'd have probably spent that much (or more) throughout the year anyway. It never fails to make my lashes longer and thicker with just two coats. I've never tried a mascara as good as Dior Backstage before and really recommend it. Apologies for the picture from the internet, My camera on my phone is really rubbish and this awful winter darkness makes it nearly impossible to take good enough photos. 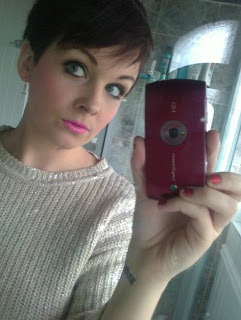 I love purple and smokey eyes are one of my favourite looks so to combine the two is a massive thumbs up from me! Thought I'd do a FOTD post today for you all. We decided to come to my mums earlier than Christmas day so we are here now, I forgot to bring my camera though and had to use my phone so the picture quality isn't great. I look a bit gormless in this photo don't I? Face- Bourjois Healthy mix foundation, VIVO baked bronzer, Both the blushers from the Blink and Go palette mixed together (below). 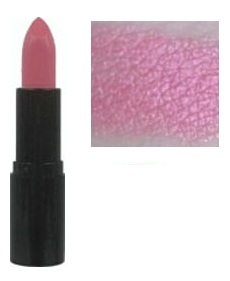 Lips- Collection 2000's Pink Shock lipstick. Eyes- Blink and go palette (I've circled the two shades in the photo below), black liquid eye-liner on the top and black kohl eyeliner on my lower waterlin, Dior's Backstage mascara in black. Easy peasy... the Jersey Shore girls! I don't usually post about what I receive in my Glossybox but this has been my favourite product so far, I absolutely love it! 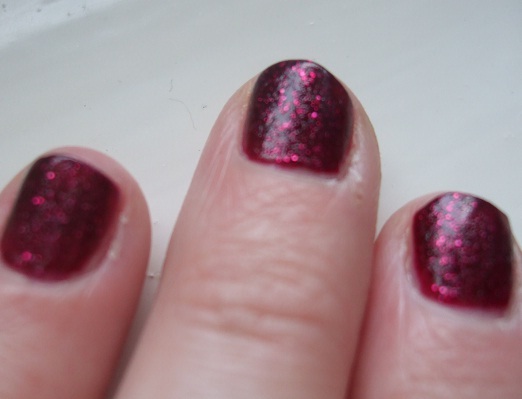 As soon as I opened my box yesterday and after squealing with excitement, I HAD to try the nail polish I received- Deborah Lippmans' Razzle Dazzle. I decided to pair it with Collection 2000's Damson Jam. 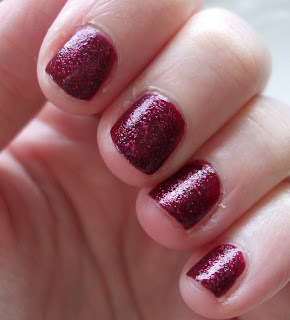 Eurgh, I hate that my nails are so short. They have become so weak and thin! 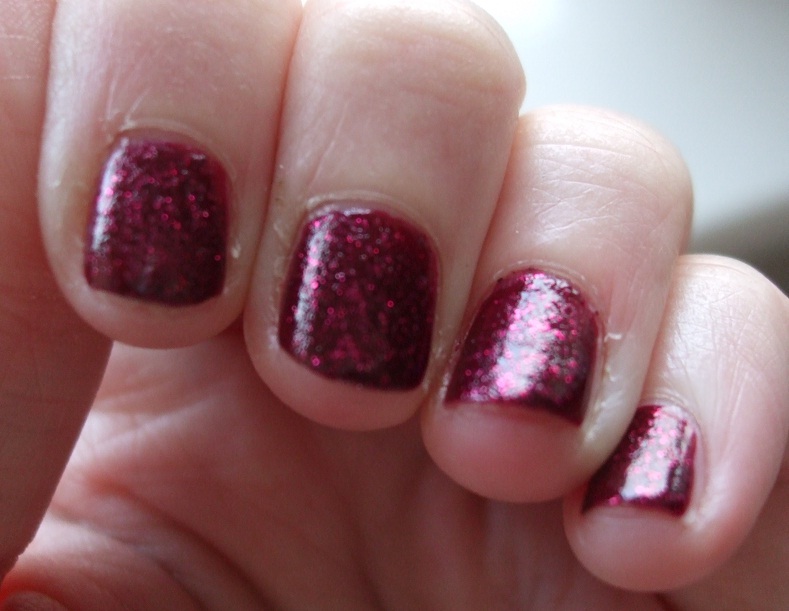 I used one coat of Damson Jam and two coats of Razzle Dazzle. 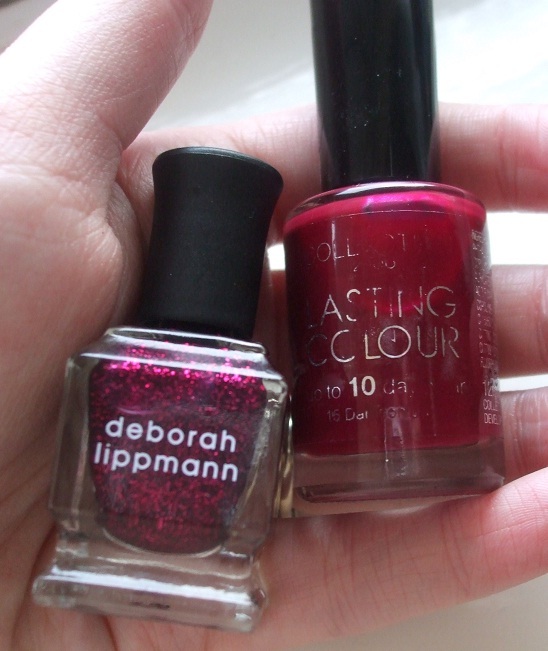 I'm really tempted to buy some more glitter polishes by Deborah Lippman, I've seen a few I like the look of already. 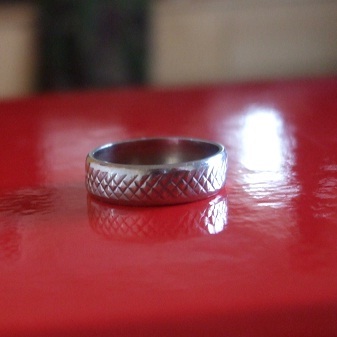 My favourite piece of jewellery is definitely my wedding ring. I only got to wear it for a month after we were married as I got pregnant and put on weight straight away. I stupidly had it resized before the wedding when I was at my thinnest! I'm still not at my pre-pregnancy weight yet so it still doesn't fit :-( I'm tempted to get it made bigger but then I'm worried it might end up too big when (hopefully) more weight comes off. My wedding ring means alot to me for another reason other than being a symbol of the most perfect day for me and my husband, it was my mums wedding ring. She's not divorced but they still live together and aren't actually together any more (very strange, but that's a whole other story!) but it meant so much to me when she handed it over as I know what she had with my dad was real and when things started to go bad it hurt her alot. Lucy from Lucy writes just posted this and as I'm in a very festive mood I've decided to do it for myself. I do apologise if you don't like these kind of posts! Hot chocolate, Egg Nog is vile! A hot chocolate with Baileys in is the BEST! It depends what the theme of the tree is, I think white lights are beautiful and really classy but my mums tree is covered in multi coloured ones, her tree is really random so it looks good. Yup, its not real though. We have it hanging above the kitchen door. Its gotta be the Christmas dinner, made by my mum. Her home made stuffing is AMAZING. Its red and gold, mainly round baubles (glitter, shiny, matte, sequinned) but we have things like reindeer, stars, icicles, presents etc aswell (all red or gold of course), the lights are plain white. I love the snow! But I hate having to go out in the car in it, scares the sh*t out of me! What's the most important thing about the Holidays for you? Seeing my children and family happy and enjoying spending time together. This question should be "What ISN'T your favourite dessert?" Lol... I am a pudding monster, anything sweet and I will love it. Last year my mum bought a really rich chocolate tart, it was heaven. Listening to Phil Spectors "A Christmas Gift for You" album whilst decorating the tree. 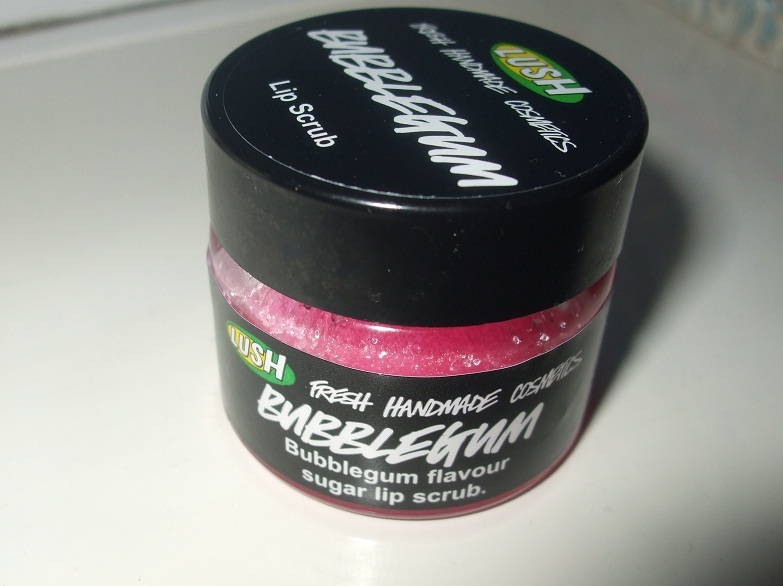 Whilst in the shower last night I decided to use my new Lush bubblegum lip scrub (god I LOVE the smell and taste of this little product!) My face was feeling particularly dry and I had ran out of exfoliator... I looked on the ingredients of the lip scrub, it was pretty much all natural stuff so I thought "why not try it on my face?"... I took the tiniest amount and rubbed it all over my face (minus the eye area of course), then I rinsed off and patted dry. My face was really smooth! 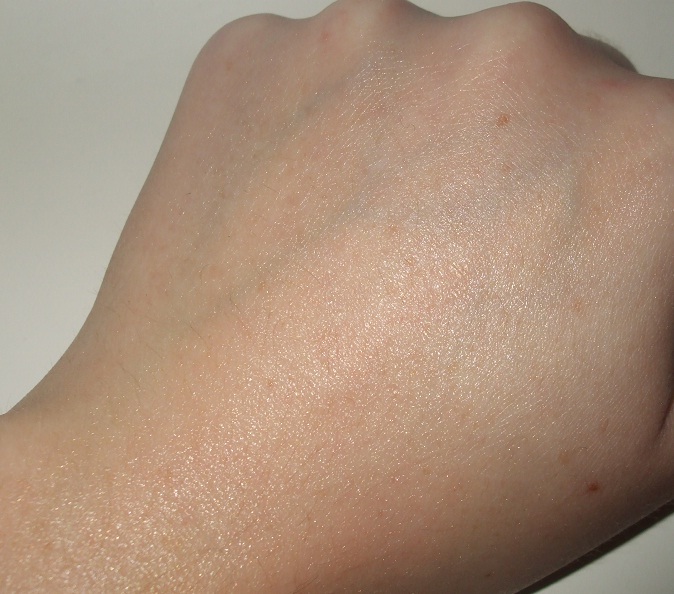 I was waiting for some sort of redness or itching to kick in but nothing. I moisturised and went to bed. This morning my face was lovely and soft, all the dry bits around my nose and T-zone were gone. So Lush's lip scrub isn't just for the lips, its handy for the face too :-) another good reason for me to re-purchase when I run out! If you give it a try, let me know! I posted about Superdrugs' Vitamin E Shimmer Lotion for the face awhile ago (see post here) and as I loved it so much I decided to purchase the one for the body too. 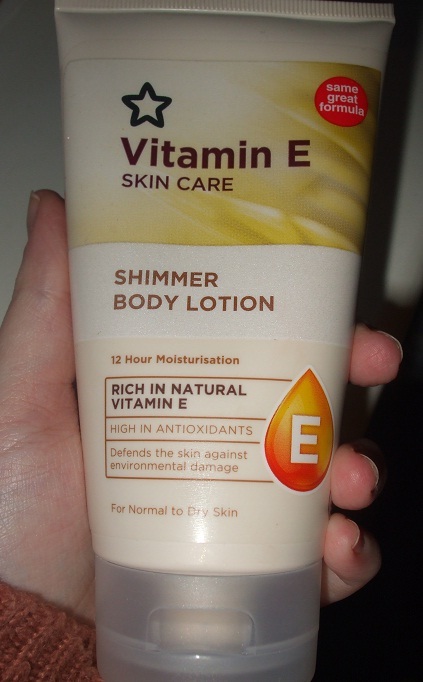 I absolutely LOVE this body lotion. 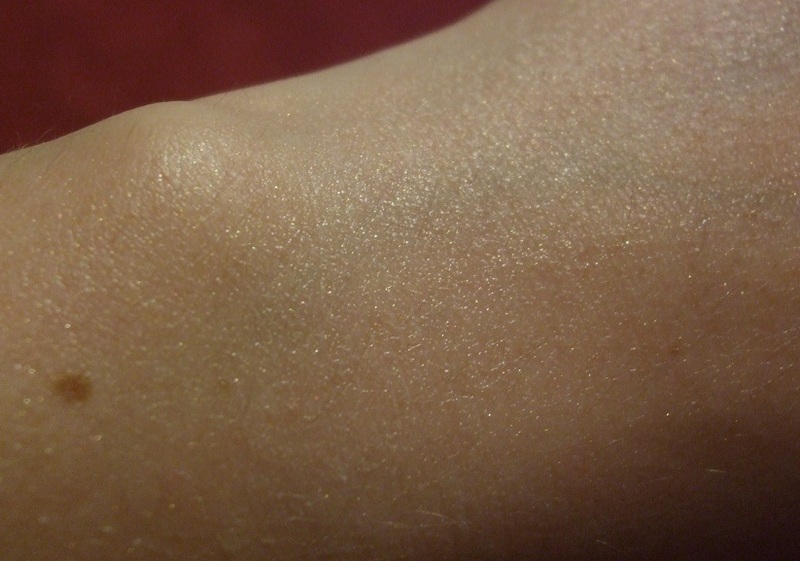 It has such a lovely golden shimmer to it and makes your skin glow. It smells amazing too, like The Body Shops' Shea Butter. 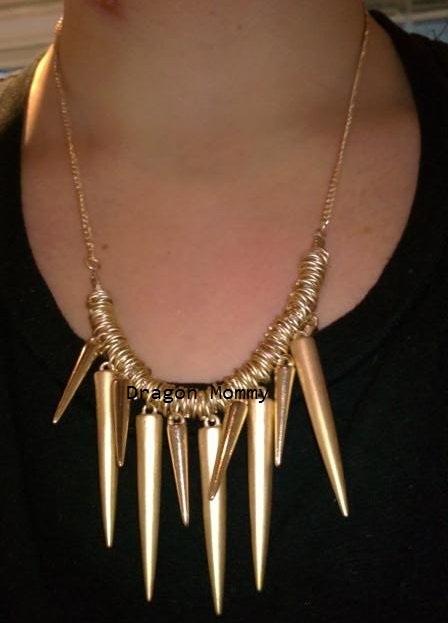 It looks gorgeous applied on the collarbones and chest. I love the fact it sinks into the skin well without leaving a sticky or greasy feeling afterwards, and my skin feels lovely and soft. For £2.99 this is a bargain and I shall definitely repurchase when I run out. Gift ideas for Sweetie Lovers!